I also wanted to get back to my roots exploring, hiking and trekking, activities that for one reason or another took a backburner once I hit college. And is there anywhere else more beautiful than New Zealand to get back to nature? Nope, definitely not. And while I did a few hikes here and there after I arrived, I hadn’t done any of the Great Walks or epic multi-treks around New Zealand, not exactly from fear, but more because I didn’t know where to start in terms of having to prepare. But lucky for me, this blog brought me in contact with Jenna and Jordan from Living a Kiwi Life, an awesome Canadian couple who are dedicated to experience the best New Zealand has to offer in outdoor activities. Seriously, these guys are an inspiration! After inviting me to tag along with them as they explored Mt. Doom and Mordor on the North Island, I was ready to go and try out some hikes on my own. Knowing that I wanted to share more about New Zealand hiking with you all, they kindly agreed to write a little guide breaking down more or less everything you need to know about hiking in New Zealand. Enjoy and good luck! Get walking! Before we moved to New Zealand we had never heard of a ‘Great Walk’. Passing through diverse landscapes of native forests, beautiful lakes, tops of mountains and deep valleys, New Zealand’s nine world class multiday hiking trails provide access to its incredible national parks. In addition to these premium tracks, New Zealand has thousands of backcountry hikes all across the country to explore. It was during our first weekend here while staying with friends in Auckland that we learned about these incredible tracks when they gave us a ‘Tramping in New Zealand’ guide to get us started. Soon after they sent us a link to their favourite tramp – the Kepler Track Great Walk. Jordan saw the photo below he and “I don’t care what we do on the South Island as long as we do this!” – and our love for these walks began! Nine months later we have experienced 8 of the 9 Great Walks including other incredible hikes like summiting Mount Taranaki, the Tongariro Alpine Crossing and Mount Fyffe. Back in Canada, we had two options for camping. Either drive up to a fully serviced campsite or brave a backcountry trail with just an open space to pitch your tent – no shelter, no water and only a basic composting toilet (if you’re lucky). Given the options are quite extreme, most tend not to venture much further than their car can drive. What I love about New Zealand is they’ve built a massive network of huts throughout the country that offer people a comfortable, dry place to sleep while providing access to remote areas of the country. Large chalets built in the heart of New Zealand’s backcountry offer ANYONE the ability to get outdoors without having to be an ‘outdoorsman’. Eliminating the concern of sleeping in the rain, being too cold at night, or having to carry all kinds of expensive equipment, opens up the door for so many more people to experience New Zealand’s incredible backyard! Whether it’s a coastal track, a mountain top peak, along a river or to a thermal hot pool – it’s amazing the diverse landscapes you can experience here! As we made new friends in New Zealand, including Liz, we started to share our tramping stories and soon realised we had developed a wealth of knowledge of tramping in New Zealand. That sparked our desire to share our tips with a wider audience in hopes of inspiring others to get out and enjoy these incredible walks! But in saying that, if you’re not all that keen to go it alone, def do a guided tour. Active Adventures will take you off the beaten track, local style! They’ll take care of everything, so you can focus on the scenery – which as we’ve mentioned, is epic! One of the biggest mistakes visitors to New Zealand make is assuming you don’t have to book the Great Walks in advance. 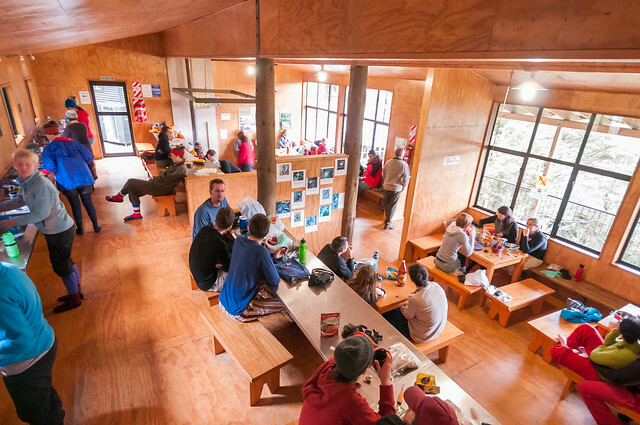 Popular tramps like Milford Track can book up months in advance, so if you’re planning to visit during the busy summer season I would recommend booking as soon as you can. The online system opens up for the season each year in July so watch the Department of Conservation (DOC) website to grab your place on the track. If you’re planning to take in some of the backcountry tracks, most don’t require pre-booking but you must buy a hut pass at a local DOC office for a small fee when you arrive if you plan to stay overnight. The DOC’s Great Walks website has a wealth of information on the tracks including detailed brochures for each walk describing the terrain, elevation, side trips and important things to know. They often provide a recommended daily agenda but some tracks offer a few options depending on how far you want to walk each day. Pay attention to the kilometers and estimated hours per day to ensure you plan your trip according to your availability and fitness level. Most tracks will require you to walk between 8-20km for up to 4-8hrs. Believe me – don’t underestimate these suggested times! I made that mistake on our first Great Walk when I said “Oh yeah we can walk 9hrs on our second day of the Abel Tasman”. I had no idea what the consistent uphill and downhill terrain would do to my knees and feet. I paid for it for DAYS! Another great source of info is the Active Adventures website. They’ll give you the lowdown on each hike, including what to pack, when to go, and which ones are best to do with a guide. The Great Walk huts cost between $22-$54 per night and campsites are $6-$18 depending on track and season. If you’re planning to do the Milford Track in high season, it’s going to cost you over $200+transportation which may seem like a lot – but believe me it’s worth every penny! A great way to save money is planning your visit to the popular tracks just before or after the high season. You pay only $15/night which is a great deal and the huts and trails are a lot less busy. NOTE: Be sure to talk to a local DOC site to check the track conditions as some bridges are removed in the off season. You should also carry with you an emergency radio beacon, especially in the off season. You can rent these locally and it will ensure emergency services can be contacted if mobile reception isn’t available. If you do have service, 111 is the emergency services number in New Zealand. We did the Kepler Track and Milford Track Great Walks last October just before the season opened and were rewarded with an amazing snowy experience at the top of MacKinnon Pass and Mount Luxmore on tracks that were nearly all to ourselves! If you want to have an adventurous holiday in New Zealand but don’t want to deal with the hassle of booking and planning the hikes and activities, consider doing a guided tour with Active Adventures and let them do the work. If you’re looking for a path less travelled, New Zealand’s network of nearly 1000 huts throughout its backcountry provide a variety of terrain and intensity levels. Many of these huts cost $5-$15/night and most don’t require any booking in advance. If you’re planning to take in quite a few, you can save money by purchasing a Backcountry Hut Pass for $122 (or only $100 through YHA outlets). This gives you access to nearly all the backcountry huts in the country and FREE access to many of the Great Walks in the off season. Choosing to stay at the huts is definitely the safest option as it guarantees that you have a warm, dry place to sleep without the hassle of a tent. Keep in mind these huts can get very busy, with up to 60 people crammed into a common kitchen area and sleeping quarters. If you like peace and quiet (and your personal space), I would suggest taking your tent. In some cases we’ve found the campsites are actually in a better location along the track. 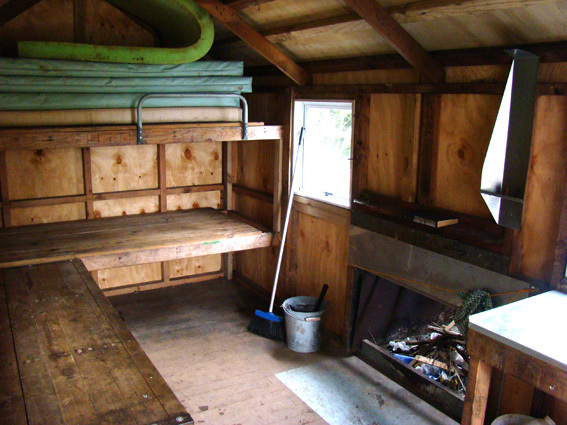 Last Christmas we did Lake Waikakemoana and had to camp the last two nights as the huts were booked up. It ended up working out great as our campsite was near the side trip to Korokoro falls which meant we could take our time and enjoy a dip in the water as opposed to rushing the side trip the next day between huts. Another piece to consider is transportation. Many of the Great Walks and tramps in New Zealand unfortunately are not a loop so they require pre-arranged transportation with a local provider by bus or water taxis. Some operators require you to show your hut bookings before you can book transportation so be sure to get the huts confirmed first! New Zealand’s diverse landscape creates an environment of uncertainty when it comes to weather. If you’re tramping in the mountains or around Fiordland – be prepared that it will most likely rain. Fiordland gets 6800mm of rain over 182 days a year so you’re going to get WET! A rain jacket and packcover is an absolute must and if it’s already forecasting rain I would highly recommend rain paints, a pack liner and even a poncho. When it poured on us for 6hrs straight on the Milford Track, despite having some rain gear, not a single inch of me was dry. I really wished I had a pack liner and one of those disposable ponchos to keep the rain from running down my back and soaking allll my clothes and sleeping bag. If you’re staying at a hut that required a booking, make sure you bring a print out of your reservation. Many tracks have Hut Wardens who will check your reservation so if you’re thinking about trying to sneak into the hut without paying you could get caught! You’ll also be handed a fine double the cost so be smart and book ahead. A lot of New Zealand runs on the honor systems so let’s not give them a reason to stop. The Hut Wardens are always very friendly and filled with lots of knowledge of the area. 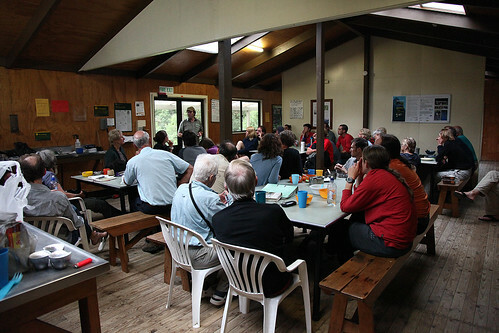 At the MacKenzie Hut along the Routeburn Track we were treated to a fascinating story on the history of the area by the famous Hut Warden, Evan Smith, who is known to cook trampers Christmas dinner during the holidays. Or, skip the planning and have someone do the prep for you, like Active Adventures. Winning! When you’re heading out for a multi-day tramp, a solid meal plan is really important. It took us a few treks to work out the best options but I think we have it down now. My favorite camping equipment we’ve purchased since moving here is our JetBoil. We saw tons of people with these in the huts when we first arrived and we quickly understood why. A compact, lightweight, self-contained stove, the JetBoil can boil water in less than 2 minutes – and when you’ve just got in from a 6hr day on the track, waiting any longer than that is just torture! It even comes in a ziplock bag that converts to a bowl, so if you really want to lighten your pack you can leave the bowl at home! One downside is a 2 person meal (which is really more like 1-1.5 person) can run you anywhere from $9.50-$15.50 depending on where you buy it. To offset the costs, Jordan and I usually plan to split a dehydrated meal and a pack of instant noodles. The $0.40 noodles makes us feel better about splurging on the good stuff. A tip we discovered was re-using the de-hydrated ziplock bag (means you can’t turn it into a bowl though) and using it to cook the noodles too! When you’re finished, it also serves as a great garbage bag to contain any messy items like tea bags and flavor packets. All the tracks have a ‘pack in pack out’ policy so you must take your garbage with you. When planning our meals we always try to get lightweight, high protein foods that will keep us full without weighing us down. I’ve been amazed at what people bring on these tramps from full bottles of peanut butter, bags of chips to blocks of cheese. We like the simpler (maybe less tasty) route like oatmeal and dried fruit for breakfast, peanut butter or pepperoni & cheese sandwiches for lunch and a variety of snacks like granola bars, almonds, apricots and a few apples. 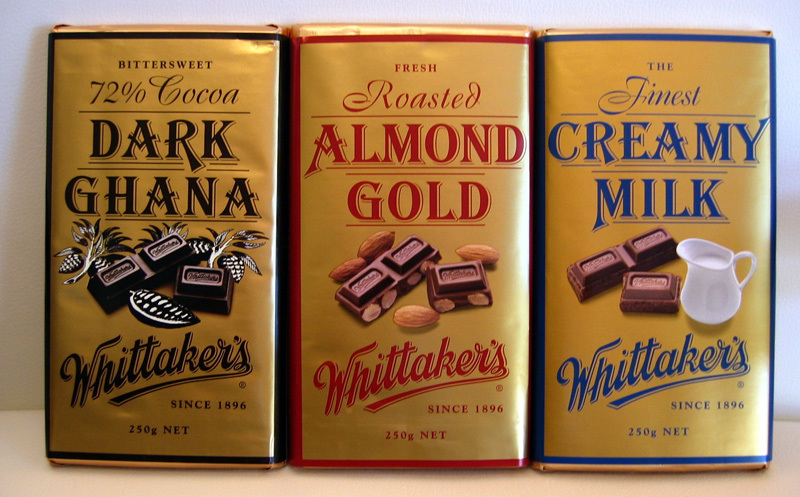 We always bring a large Whitakers chocolate bar and a bag of candy for sugar cravings. Considering the calories we burn it’s completely GUILT FREE which is even better! The only item we sacrifice weight on is WINE! I ALWAYS look forward to enjoying a glass of wine after a long day on the track. We usually take a 2-3 litre wine bag (or bladder) and enjoy drinking every last drop to lighten our packs. If you’re a hard liquor fan a lot of folks bring a flask of whiskey – whatever works for you but believe me it’s worth it! And you tend to make more friends along the way when you have some left over the last night. Lastly is obviously water. I like to use my camel pack with 2-3 litres of water for the both of us mostly because I hate stopping to get my water bottle out. I tend to drink a lot when I’m tramping so having it easily accessible is important. The huts have rain water barrels and overall we’ve found it’s clean enough to drink, however DOC always advises it’s safest to either boil or treat it before drinking. 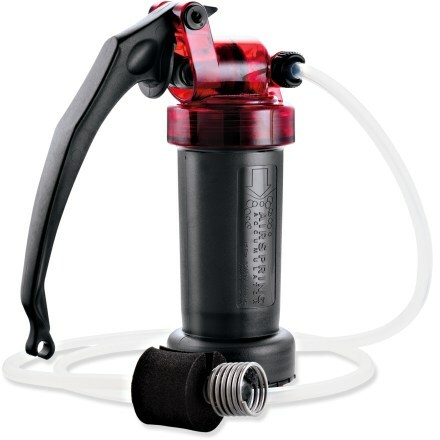 We picked up a sterilizer pen to replace our bulky water filter for when the water looks a bit sketchy, but overall have been drinking untreated water without issue (yet anyways). Here’s a snapshot of our meal plan when we head out on a 3-day tramp. When you have to carry everything on your back, your interpretation of a ‘necessity’ and a ‘nice to have’ changes dramatically. You learn to pack light and only bring what you’re willing to carry. The facilities at the huts and campsites can vary depending on the track. Great Walks are known to be much more fully serviced, with running water, stainless steel cooking benches with propane stoves, running toilets (summer season) and solar lighting. Even the campsites on the Great Walks have large shelters with stainless steel counters, rain water supply and benches to sit on. 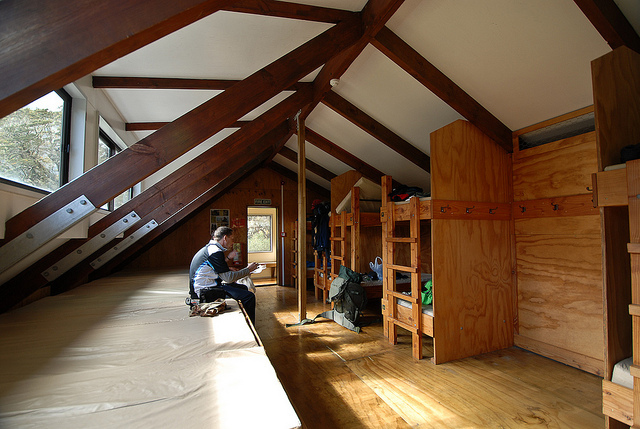 The backcountry huts can vary dramatically from tiny four bunk shacks to larger more modern buildings with basic facilities. Be sure to research what is available before heading out so you pack properly and aren’t surprised when you arrive! If you plan to stay in the huts and leave your tent at home, a 50 litre backpack should be more than enough to carry your stuff for a multi-day tramp. If you’re heading out for just a day, a smaller 30 litre day pack would be sufficient. Since we always had our tent in Canada we already owned 65 litre packs so for here it’s a bit of overkill, but it’s nice to have some extra space for all our camera gear. New Zealand’s weather can be very unpredictable. The temperature at the bottom of a valley can be quite different than an exposed mountain peak so it’s important to bring lots of layers when tramping. It’s better to have 4 layers with you than banking on a t-shirt and a down jacket – you WILL want something in between. What’s great too is those extra layers can serve as ‘stuffing’ for your pillow by cramming them into an empty pillowcase – no need to pack a big fully pillow! (even though that would be nice). But on that note, if homemade pillowcases aren’t up your alley, go guided with Active Adventures and they’ll provide the real thing! My tramping attire usually consists of a hat, sunglasses, light long sleeve, light sweater, rain jacket, camping pants (the ones that zip off at the knee) and hiking boots. Since moving to New Zealand we’ve picked up some awesome Merino tops as they are lightweight yet keep your warm and dry at the same time. The wool comes from the Merino mountain sheep in the South Island and has evolved to keep them protected from the elements. If you’re staying in a hut, I would recommend (mostly women) to bring a light t-shirt and shorts to wear to bed. With ~60 people inside a hut it can get VERY hot – even in the off season – so it’s best to ensure you have SOMETHING on or risk the embarrassment of waking up with your blankets thrown off and a crowd of people around you trying to get ready. A pair of jandals (aka flip-flops) is good too as hiking boots aren’t allowed inside the huts, so having a lightweight alternative to change into is always smart. If you’re like me, you’ll be ready to rip those boots off as soon as you can! For all that food you packed, you will need to bring utensils and a stove (like the JetBoil). The Great Walk huts are equipped with gas stoves to use (in the summer months) so you could get away with just bringing a pot but we like to have our own. To save space we pack stainless steel mugs that serve as our bowls and cups, so although it would be nice to enjoy a glass of wine with our meal, we sacrifice that to save space and enjoy a glass of vino as a pre AND post-meal. The number one items I ALWAYS pack are ear plugs and a face mask. I don’t normally sleep with these at home, but in a crowded hut these can save you from a sleepless night. Considering not everyone goes to bed at the same time, headlamps in the middle of the night can be distracting, and with the sun rising at 5am in the summer, a sleeping mask can help you STAY asleep. The earplugs however will help your sanity. Guaranteed SOMEONE in the hut will be a snorer and even if they aren’t right beside you, sound travels, so having a way to muffle that noise as much as possible is really important. Relating to more hygienic products to pack – firstly you MUST bring toilet paper. Most tramps have basic ‘long drops’ (or port-o-potty’s) but are not always stocked, so ensure you have toilet paper AND hand sanitizer. On our last night along the Kepler Track Jordan had to ‘climb into’ one of the locked summer season toilets at the hut to steal a roll of toilet paper as no one in the hut had any left! Not the best situation to be in. In addition, if you’re prone to blisters or sore feet, I HIGHLY recommend Hikers Wool. A Bivouac employee recommended it to me and it has completely changed my life! Wrapping a small piece of natural sheep’s wool around my toes before I start a tramp saves me from hours of pain later on – I haven’t gotten a blister since using it! I also starting using hiking poles when tackling the big mountains. I initially thought they were just for ‘old people’, but after seeing lots of young (smart) folks on the trails here I invested is some and are now a MUST HAVE for me. They relieve some of the strain on your knees on the downhill, and when I get into my grove going uphill, I call them my ‘speed poles’ as they help drive me up the mountain. They’re already helpful if you’re ‘scree skiing’ down loose gravel on mountains like Mount Taranaki or Mount Doom along the Tongariro Alpine Crossing. Oh yeah – ALWAYS bring a torch (head lamp) and spare batteries. It’s your lifeline for finding your bunk, reaching the toilet and packing your bag in the morning. It can also come in handy when exploring cool places like Luxmore Caves along the Kepler Track so don’t forget it! Here’s a sample list of what we usually take with us on our multi-day tramps! So you’ve planned, packed and transported yourself to the start of the track – now the fun begins! It’s always good to keep a steady pace and not try to race through the first few kilometers. Starting early means you’ll have lots of time for photo opportunities and keeping breaks short will ensure you get to the hut early to claim the best bunk. Being one of the last to arrive usually means you have little to no choice in location and can sometimes see your party split up. Once you’re at the site, take advantage of the light and go explore the area. Many huts have little side trips to beautiful waterfalls or stunning look-outs. Even if you’re exhausted from the day, it’s always worth the effort. Grab that wine and enjoy a glass overlooking a mountain or next to a waterfall – that’s been a tradition for us! When the sun goes down pull out a deck of cards and introduce yourself to some other trampers – it’s amazing the people you will meet! We met our friend Ryan on our first Great Walk along Abel Tasman who became our sidekick for completing the Kepler Track, Milford Track and Tongariro Northern Circuit! Take the opportunity to enjoy every moment you’re in the outdoors along these tracks. New Zealand has some of the most diverse rainforests in the world and no large animals that can harm you (I can’t 100% guarantee that). Turn off your smartphone and completely unplug from the social world – most tracks don’t have service anyways but just leave it in your pack and only use it if you need it to take photos (and as an alarm clock if necessary). Be sure to pack your camera and extra batteries as you will be stopping every 5 seconds for one incredible shot after another! Jordan usually carries 8 kg of camera equipment and he always says it’s worth it every time! New Zealand is known for its diverse birdlife so keep your eyes out for the musical Tui, the large Forest Pigeon and cheeky alpine Keas (WARNING – Do NOT leave ANYTHING outside the huts at night – those curious Keas will eat ANYTHING! I nearly had my walking poles swiped by one in the middle of the night!). Stewart Island’s Raikura Track is a sanctuary for birds and your best chance to see a Kiwi bird in the wild! It’s no question these walks are a challenge but New Zealand has enabled the tracks to be so easily accessible that ANYONE can do it. Regardless of age, fitness or experience level I feel anyone can take on these amazing adventures if you’re well prepared, smart in your actions and take your time. We met an 80 year old man on the Routeburn Track who completed the 3 day, 32km journey all by himself! He wasn’t the fastest on the track, but he did it at his own pace and was quite an inspiration! So go out there and enjoy what New Zealand has to offer! It’s one of the best backyards in the world so have some fun! For more information on our hiking experiences in New Zealand, you can check out the Tramping section on our blog and YouTube webseries Living a Kiwi Life! Are you a fan of the outdoors and hiking? Would you like to come tramping in New Zealand one day? jeez had no idea so much went into the hikes! How badass! I would love to do a little more trekking in india; but when I moved I bring luggage full of food rather than my hiking equipment haha darn. haha I can totally relate! If it was up to me, I would have had a suitcase full of food too, but Jordan made sure we packed mostly hiking gear and I’m glad he did now 🙂 Some places rent out hiking equipment, I know down in Te Anau here in New Zealand a company (Bev’s Tramping Gear http://www.bevs-hire.co.nz/) will rent you anything you need so if you’re ever in New Zealand you always have that option! Fantastic information! I am really keen to do some of the Great Walks and I didn’t know where to start so this is very helpful. Thanks Zoe, glad you enjoyed the article! It was really interesting trying to put all these tips down on paper as we too take most of it for granted now! You don’t realise how much you’ve learned till you try to write it down!